1. Wash the fish and pat dry on a kitchen towel. 3. Remove the fish from 1st marinade and pat dry again. If there is excess moisture, the fish will not fry crisp. 4. In a bowl, mix ginger-garlic paste, ajwain, chilli powder, salt and colour. 5. 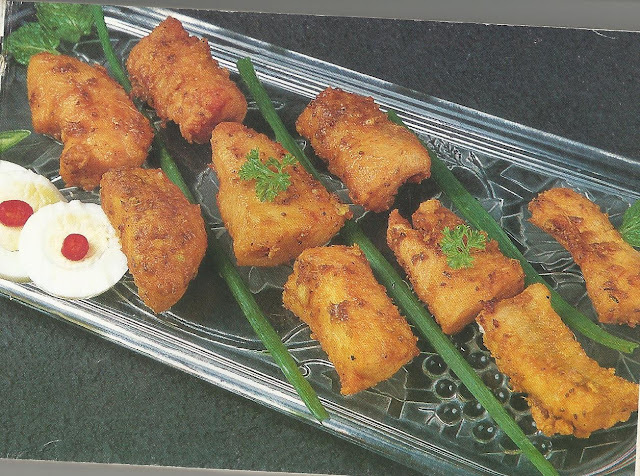 At the time of frying, sprinkle dry besan and cornflour on the marinated fish. Mix well. 6. Heat oil in a kadhai. Fry 4-5 pieces of fish at a time on medium heat till the pieces are crisp. Drain on absorbent paper. 7. Arrange fish pieces on a serving platter. Garnish with lemon rings, onion rings and mint leaves. Serve hot with mint chutney.